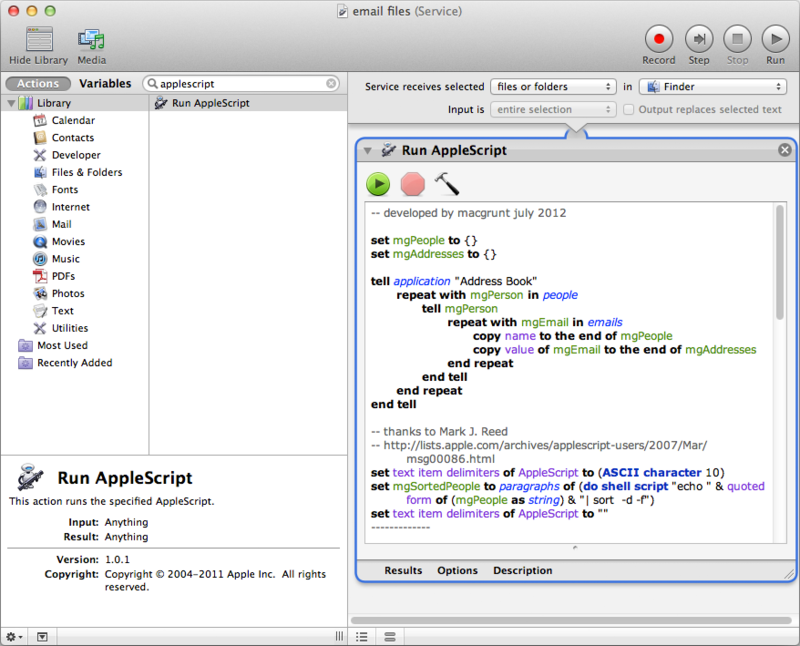 the previous post — email file from finder — showed how to use applescript to quickly attach a selected finder item to an email — adding a recipient, subject and basic content along the way. 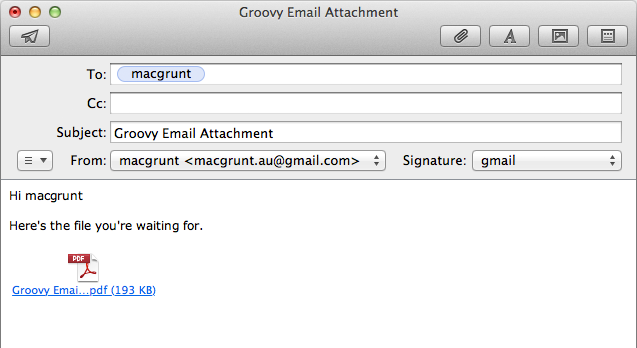 this post will show how to adapt that script to allow for multiple attachments and multiple recipients. your homework for this week is to come up with a way to make the salutation personal if only one recipient is selected (eg. 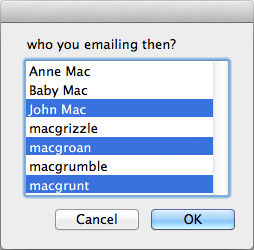 “Hi John”) but generic if multiple recipients are selected (eg. “Hi all”). 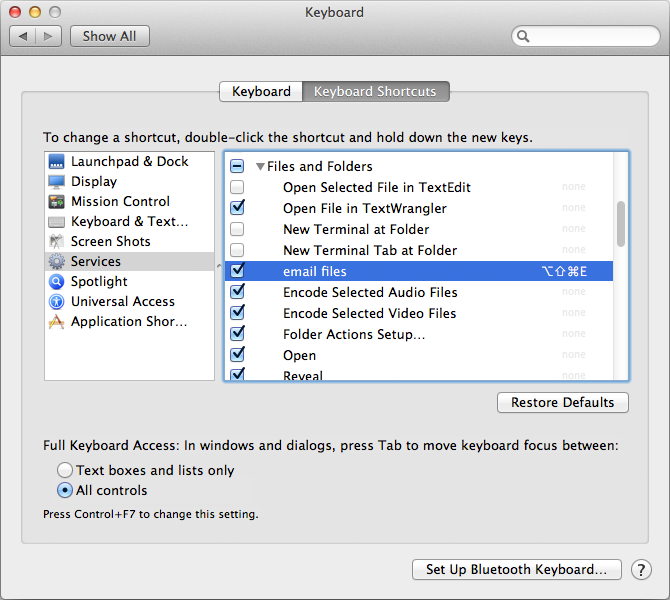 next time we’ll look again at how to turn this script into a service for easy accessibility from within the finder. 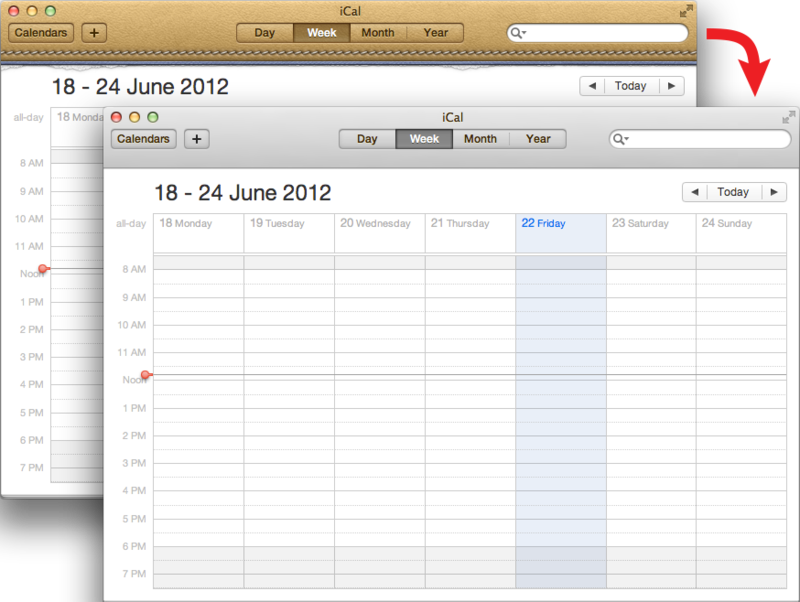 what in the name of hideous monstrosities was apple thinking when they shipped lion with those fugly interfaces for iCal and address book? that faux baby-poo leather and torn page look is the naffest thing apple have done since that white crumb-catcher keyboard. 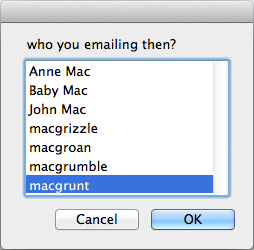 the styling for the app must have been outsourced to some executive’s pampered, brain-damaged, drug-addled nephew. thankfully it’s easy to fix — to ease your troubled eyeballs, just replace all the graphics in the app package with new ones. you can find aluminium-look graphics and instructions on how to install them at MacNix. 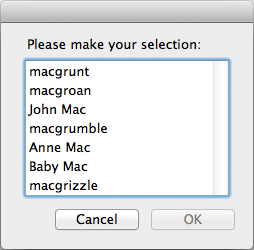 if you appreciate how easy it is — flick MacNix a donation. some workflows involve creating standard sets of job folders at the beginning of a project and then going through and cleaning out any unused folders at the end. this is a good way to standardise archiving procedures but it can also be tedious to clean up once the project is done. 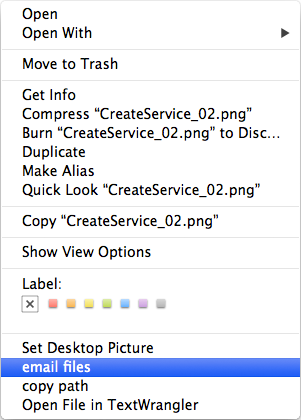 this post shows how to easily delete empty folders using applescript. thanks to xander at cadcoder (sorry this link seems to be broken at the moment — Aug 2013) for the basic structure of the shell command. 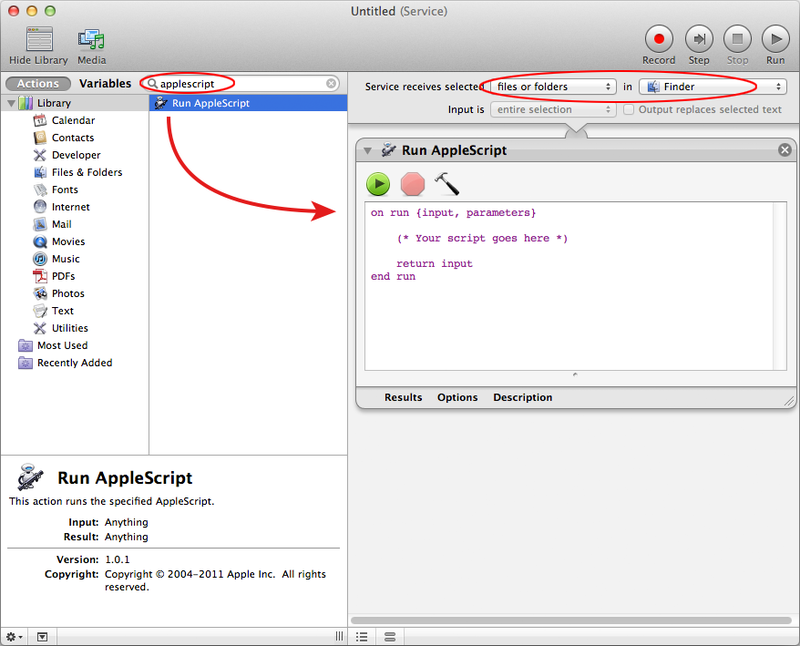 to follow along, copy and paste the script examples into applescript editor (found in applications > utilities) or, for older OS versions, script editor (applications > applescript). we’re going to set this one up as a droplet (so you’ll save it from script editor as an application). you can save a droplet to your desktop or drag it to your sidebar for easy access. to run the script just drag and drop a folder onto the droplet’s icon. do shell script "cd " & quoted form of POSIX path of mgItem & " && find . -type d -empty -delete;"
in the shell, a folder is known as a directory (d). the first part of the command changes the current directory (cd) to our dropped folder. then it performs a search of that folder (find) for empty subfolders (-type d -empty) and deletes them. simple. this works a treat — most of the time. but macs have these dastardly hidden files, the most common of which are the good old .DS_Store files which help the finder do its thing. a folder containing nothing but a .DS_Store file looks empty, but as far as the shell is concerned, it’s not. do shell script "cd " & quoted form of POSIX path of mgItem & " && find . -name .DS_Store -delete; find . -type d -empty -delete;"
that’s about it — super fast, super easy way to clean out any unused folders. when an applescript is saved as a droplet, its icon includes a downwards pointing arrow. the on open mgItems line at the start of this script is what allows the saved application to run as a droplet. 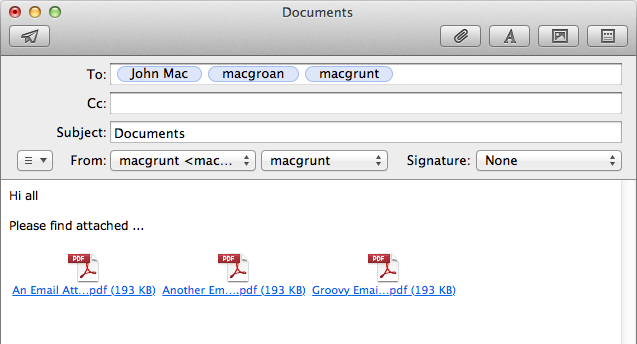 without that on open command you’d need to find some other way to reference the folders to be processed. 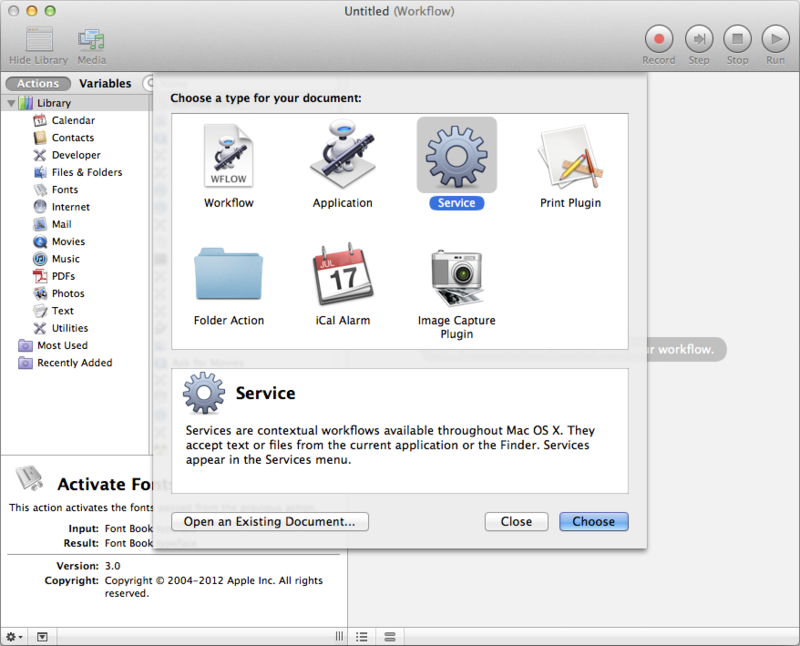 renaming finder items shows a couple of other ways you could do this.